Oh Deer Lab! - AP Environmental Science! 1. Name three essential components of habitat (things animals need to survive). 2. Explain what caused the increase of "deer" during the activity you participated in. The caused the increase of deer is their so much resources. 3. Explain what caused the decrease of "deer" during the activity you participated in. 4.Define the term limiting factor. Give examples of limiting factors for the deer in our activity. Limiting factor is limits the growth or development of an organism, population, or process. For example, the deer lab that my class participated to do. 5.Graph the data from the activity and attach to this sheet (make sure to correctly title and label the axes). Describe what the graph of our data looks like. How and why did our deer population change? My graph looks like a mountain that is next together. 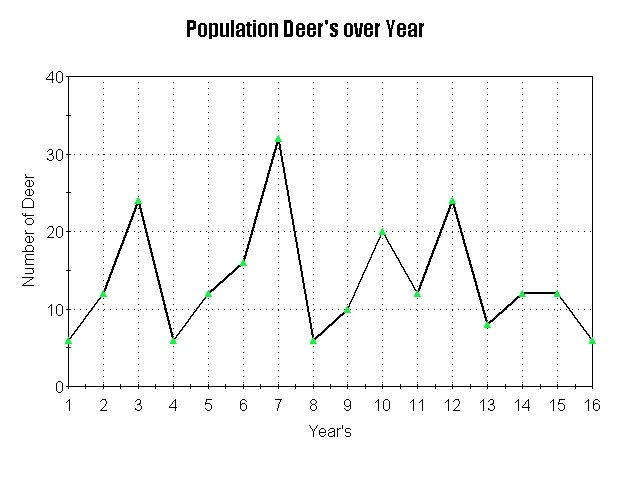 The deer population change by its increasing or decreasing. It's increasing because their are very much of resources for the deer. Decreasing because of lack of resources, natural disaster, and the predators such as the wolves. 6. Often we use the phrase "balance of nature" to describe a healthy ecosystem. Based on our graph, what does the "balance of nature" look like? Should we expect populations to be static (unchanging) or do they naturally fluctuate? Explain. To balance of nature they need enough resources for everyone so they have to compete or fight for the food that they needed daily. With the balance of nature then it might help the conflicts in the ecosystem that human causes.